The Company. Our Functions and Roles. Day-to-day operations of airports as it relates to the safety & security of infrastructure, the adequacy of facilities installed, and the physical integrity of all equipment & persons used. Refer to the provision and maintenance of all services required and deem necessary for the efficient operation of airports (ramp service, parking for aircraft and vehicles, etc). The ‘Physical’ Development functions address expansion, development and the modernization needs of prescribed airports and other civil aviation infrastructure. 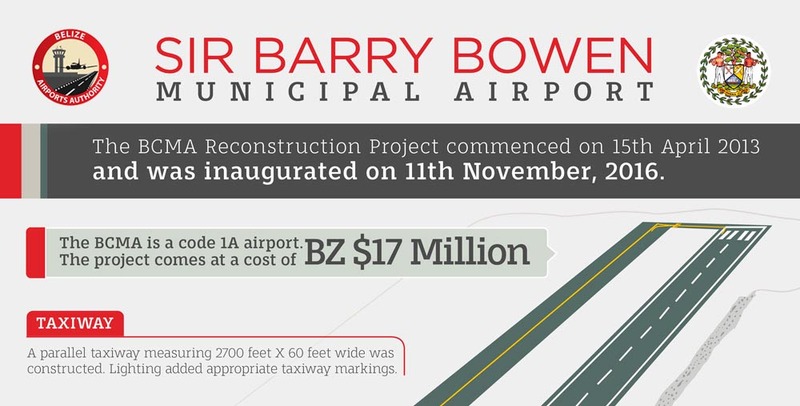 The Ministry of Tourism and Civil Aviation, in collaboration with the Belize Airports Authority (BAA), is pleased to announce the inauguration of the new Sir Barry Bowen Municipal Airport, formerly the Belize City Municipal Airstrip. The airport was expanded and renovated through a BZ $17 million project implemented by the BAA through a loan from the Social Security Board.